While Las Vegas has been well known for its amazing tourist attractions, hotels, and glitzy casinos, it is also a fantastic place to live. The weather is warm all year long, and you will find some of the best golf courses in the world. There are numerous opportunities for education and employment. The cultural diversity in Las Vegas is abundant giving you the ability to experience all kinds of exceptional cuisine, interesting events, and activities. Purchasing a newly constructed home in or around Las Vegas has more benefits than ever imaginable. Most new developments and communities are a collaboration of many different builders providing a wide variety of building styles, floor plans, lot sizes, landscaping styles, and pricing options throughout each community. New communities also offer resort style clubhouses, community centers, pools, and fitness centers. In addition, there are recreational facilities, beautiful hiking trails, an abundance of parks and some of the best new schools, shopping and restaurants any city would be proud to boost about. 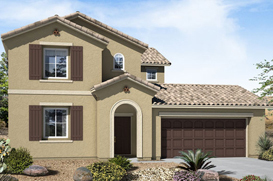 There are several reasons why purchasing a newly constructed home in Las Vegas is right for you. Why settle for someone else’s vision and taste when you can select your favorite countertops, cabinets, appliances, carpets and flooring? While you’re at it, you can choose gorgeous bath tiles and fixtures, lighting and other options that will reflect your style. Want a master bedroom on the second floor with an enormous his and hers walk-in closet? It can be yours. Would you like high beam ceilings or a luxurious, master bath? Done! Perhaps, you would like a den with a fireplace or French doors that open to your private pool or patio? It is easy, when you build your new home your way.